Medium - €42.99 Only 1 left! Do you want to rule the party scene this Halloween? Well, that can be easily accomplished once you make your entrance wearing this Exquisite Cleopatra Women’s Costume. Once you make your elegant transformation, you’ll have even the mightiest of warriors and richest of kings hanging on your every word! Cleopatra is one of the most iconic women in all of history. She was the last active pharaoh of a Ptolemaic Egypt and had quite the impressive romantic résumé. Though many people may call you Cleopatra, you can also spice things up a bit by going by the Queen of the Nile or the goddess incarnate. Pretty cool nicknames if you ask us! Have your boyfriend or another friend go out as Marc Antony or as Julius Caesar and be one of the most historic celebrity couples. Once the two of you enter the Halloween party, no one will question your right to rule. Everyone will be more than happy to serve you as long as they get to be in the presence of your Egyptian elegance. In order to complete this exquisite look, you need to make sure you have plenty of gold accessories. Check out what we have in stock, there are plenty of bangles to add to your order along with our Cleopatra headpiece. Then to finish of this head to toe transformation grab a pair of our Egyptian sandals or our golden goddess heels! 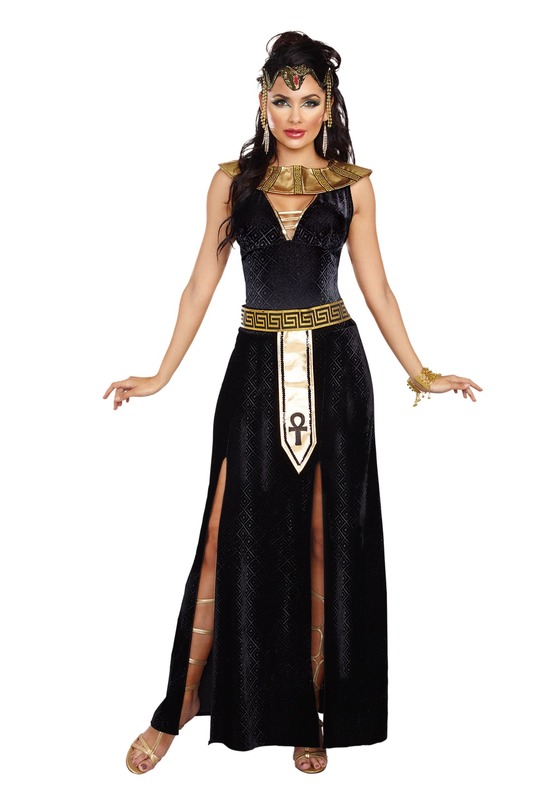 If you’re ready to reign over the party scene this year then get your hands on this Exquisite Cleopatra Women’s Costume. Tap into her famed powers of seduction and impressive intelligence and rule Halloween with an iron fist!